No work-at-home scheme is more misunderstood and demonized than network marketing. At it’s best, network marketing is seen as unimportant mommy-businesses or something strange uncle Bob does to find his fortune. At it’s worst, network marketing is perceived as being full of greedy snake oil salesmen and shysters. But once you get past the old attitudes and misconceptions, network marketing is a viable way to start a part-time home-based business. The first step to success is to decipher the myths from the truth. Myth 1: Network Marketing is an illegal pyramid. Truth: In the illegal pyramid test, the shape of an organization does not determine legality. If it did, most businesses and organizations including the government would be illegal because all have a pyramid structure. An illegal pyramid scheme provides no products or services, and pays according to the number of recruits. Legal network marketing programs offer products or services that are sold to consumers. Recruiting new members allows for increased income based on the volume of sales. Other laws legitimate network marketing companies adhere to include publishing average income statistics, no inventory requirements, and refund options. Myth 2: Only the guy at the top makes money. Truth: This argument more accurately describes a “job”. How often does a minimum wage worker become the CEO? In good network marketing companies, members can make any amount regardless of where they are in the organization. Income is related to effort not position. Myth 3: Network marketing uses people. Truth: Success in network marketing comes from helping others reach their goals. A person cannot earn income off the efforts of their recruits without investing time in helping them earn income, as well. Admittedly, some network marketers see potential recruits as dollar signs, but those people are not as successful as those who are genuine in their effort to help their recruits do well. Myth 4: Eventually the program will get saturated. Myth 5: Network marketing doesn’t work. Truth: According to the Direct Selling Association, in 2013 the direct sales industry grossed $31.63 billion in retail sales in the United States. Worldwide that number increases to $100 billion according to Zig Ziglar’s book Network Marketing For Dummies. These numbers indicate that network marketing can work. Success or failure has less to do with network marketing itself and instead is determined by the amount effort one puts into the business. Many bloggers, eBayers and other home business owners don’t do well or quit too, but you don’t hear people saying blogging and eBay don’t work. Myth 6: No one really gets rich in network marketing. Truth: It’s true that not everyone succeeds in network marketing. The 2-10% of network marketers earning big money are the same 2-10% who work consistently on their businesses. But getting rich shouldn’t be how network marketing is judged. If getting rich is the measure of success, then the majority of employees in traditional jobs are big failures. Instead, network marketing should be measured by the number of people who reach their goals. Many people in network marketing find success when they earn enough to stay home with the kids or pay off debt. Myth 7: Network marketing is a cult. Truth: I admit it, I have met a few fanatical network marketers. But fanatics exist everywhere. Network marketing companies don’t require fanaticism, and in fact, most work hard to keep its representatives grounded in facts and figures. Network marketing has it’s issues, but much of them hinge around false and misleading information. Financial Gurus, such as David Bach and Robert G. Allen both recommend network marketing and direct selling in their books, which suggests that network marketing is gaining some respectability in the mainstream business world. 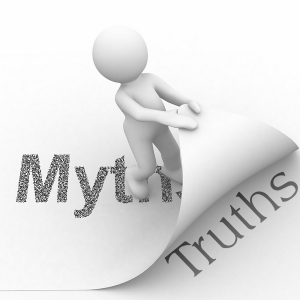 Nevertheless, misconceptions and myths persist. Don’t let these false beliefs stop you from considering a network marketing business. You can achieve success in a network marketing venture if you gain a solid understanding of the industry, choose a company carefully, find a quality sponsor, and commit time and effort to your business. If you enjoyed reading this article please Share it on the left so more people can benefit from it and post in the Comments below.